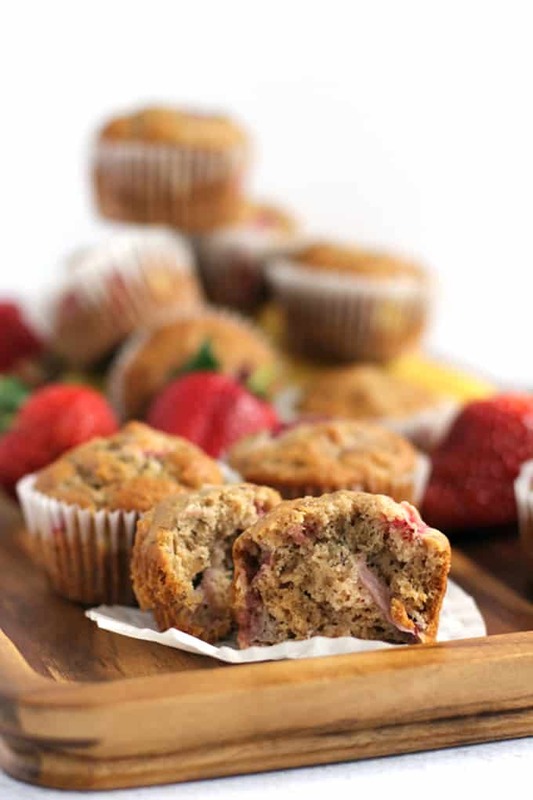 There’s nothing better than one of these Strawberry Banana Muffins to begin your day. A moist and fluffy banana muffin is bedazzled with large pieces of diced strawberries to create a muffin that truly screams spring. If there’s one thing I know, it’s that I’ve yet to meet anyone that doesn’t love having fresh muffins greet them for breakfast or brunch. Or a snack. You know, whenever. Especially when said muffins contain in-season ingredients like these Strawberry Banana Muffins. If you’re that one person in the world that doesn’t enjoy a good muffin, do your self a favor and quit reading. For my fellow carb addicts, I’m here to please! When I decided that I wanted to share this recipe with you, I had to dig in my e-mail recipe folder to find it. 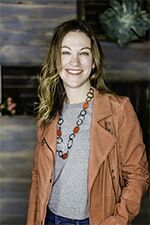 The subject of the e-mail from my friend Gabby was “Recipe for Super Mama.” If you received an e-mail with a subject line like that, wouldn’t it more than make your day? Even if you knew that it was the furthest thing from the truth? The answer is definitely yes. Even four years after she originally sent it, it made me smile when I saw it. If she thinks I’m super, I can’t even fathom what the correct adjective for these Strawberry Banana Muffins is. Stupendous? Out of this world? Fabulous? I’ll get back to you on that one. These muffins are the perfect treat for any mama in your life. Your own mother, your mother-in-law, your grandmother, the awesome women that live next door to you that said they won the neighbor lottery when you moved in. (Yes, my neighbor actually said that even though my middle child has no volume control and squeals at a decibel that will call any dog within the county when she’s outside.) 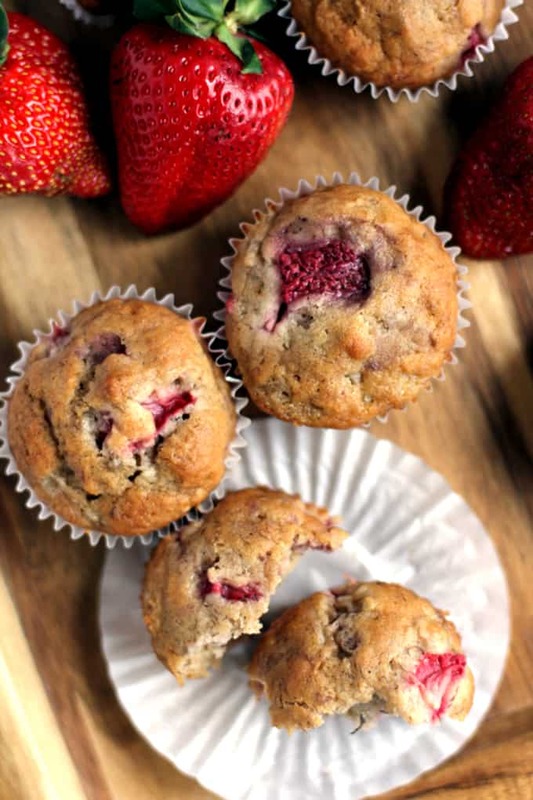 Large pieces of strawberries bedazzle this banana muffin batter. 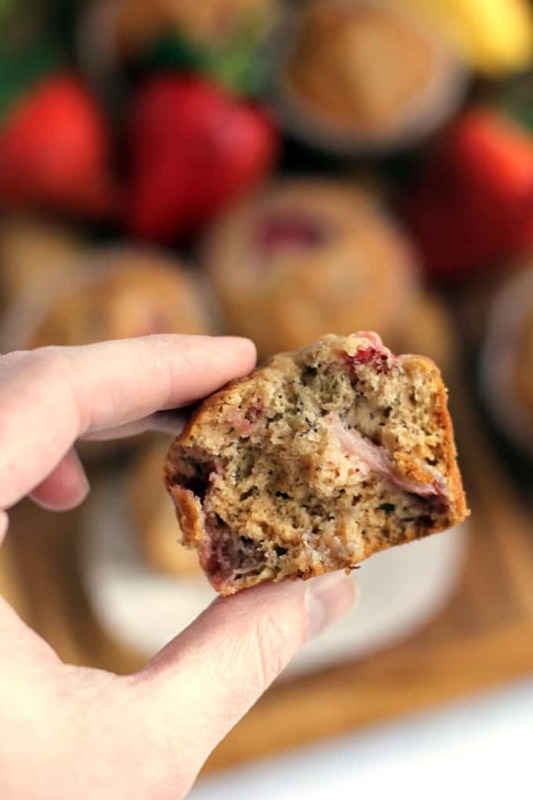 These Strawberry Banana Muffins are moist, pretty, and they freeze really well. Strawberries on sale this week? Buy extra to make a large batch of muffins. Your family will thank you! In fact, I’m betting these would be the perfect beginning to a muffin bar of sorts – an amazing way to feed a crowd for breakfast or brunch. Some of our other favorites are my decadent Pumpkin Chocolate Chip Muffins, delicious Cherry Almond Oatmeal Muffins and lightened up Yogurt Blueberry Oatmeal Muffins. My friends have also shared delicious banana muffin recipes like these Cinnamon Swirl Peanut Butter Banana Muffins that have all my favorites stuffed inside, these rich Cream Cheese Banana Muffins and these Butterscotch Banana Muffins – love that flavor combination! In the bowl of an electric mixer, mix together egg and sugar until well combined. Mix in butter and vanilla. Squish bananas into egg mixture and mix until bananas are broken up and well combined. In a separate bowl, whisk together flour, baking soda, cinnamon and salt. Add strawberries to flour mixture and toss to coat. Add flour mixture to egg mixture and mix until just combined. Using a large cookie scoop, add batter to muffin tin. Bake until golden brown, 20-25 minutes, or until a toothpick inserted in the muffin comes out clean. Cool 2 minutes in the pan before removing to a wire rack to cool completely. And look how awesome they are when packaged! I’ve partnered with my dear friend, Jennifer of Jennifer McGuire Ink, again this month who created this amazing packaging for my muffins. Make the day of a mama in your life and gift them with love from your kitchen this Mother’s Day. 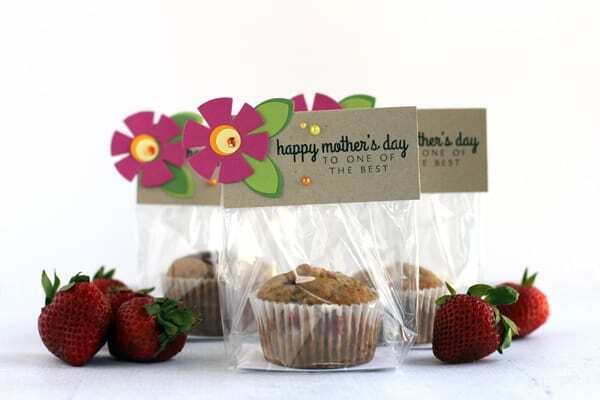 Click here to see more information about creatively packaging your muffins for Mother’s Day, including a video, from Jennifer. Can you use the oatmeal muffin mix for this recipe? Hi, Barb - I haven't tested it with this but you've given me the push to make that combo with the mix! How would I adjust this recipe if I used thawed - previously frozen - bananas and strawberries? Hi, Tiffany - I haven't tried the recipe that way so I can't say for certain. Hi, Donna - This recipe makes about 2.5 dozen muffins. I was thinking what recipe I could use to use up the many bananas and strawberries I have, then I remembered I marked this recipe. I'm not very good at cooking or baking, but this recipe was definitely easy to follow. Just pulling them out the oven they smell so good. They definitely taste good too! Thank you so much for your kind words, Rachel - hope you enjoy the muffins! These are beautiful, and I'm all about strawberries right now. I can't seem to get enough! Yum! The muffins were good, I had a lot of fun making them. 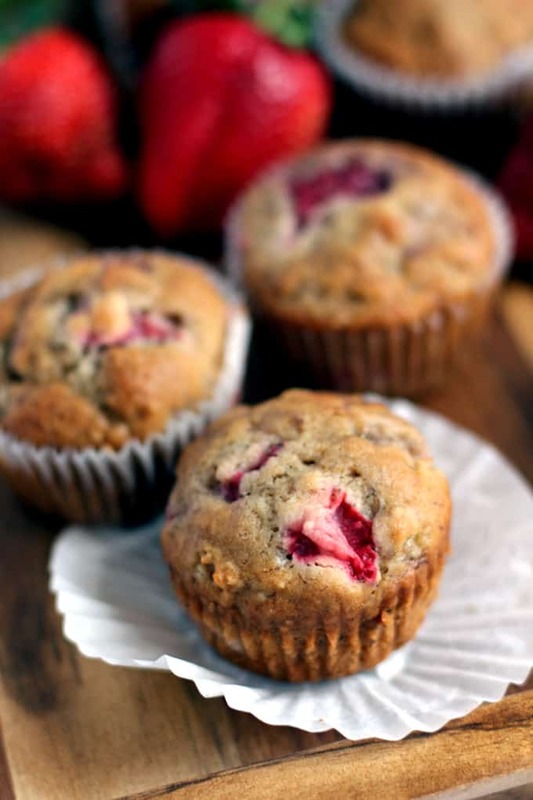 Be careful with adding strawberries, because they can make your muffins soggy. I think I put a lil to much strawberries. I'll know to put a lil less than a cup for next time. Also, I added more cinnamon and added nutmeg. Overall my family loved them, and finished the whole batch within a day. So glad that you and your son enjoyed them, Joy! How fun to spend time together in the kitchen. A great choice for a late night snack, Bianca! Hi Melanie, I come here from Jennifers blog. And I was curious about the muffins. But I have a question: What kind of "cups" do I have to use? Do you have a suggestion about the amount of gram's I have to use for this recipe? I think these muffins are super tasty and the packaging is awesome! Thanks for sharing! Hi, Leni!Unfortunately, I'm not sure of the conversion rate between cups and grams but now there are several online calculators that would help you make the conversion! These look wonderful Melanie! My family loves muffins and I can't wait to try these! Our family loves these, Shannon. Make sure to double the batch and you'll have some extra to freeze for a quick weekday breakfast! A quart? HA! Let's up the ante and say a flat! These look great! Nice packaging, too. :D When I had my "comfort catering" business, one of my biggest sellers was my banana bread. For variety, I offered it with 'add-ins' including fresh blueberries or raspberries or strawberries or a combination 'mixed berry' banana. I think these fresh fruits would work with the banana muffins, too. The key is to not add too many so they bake through and aren't overly moist. TFS I'll be back later to check out some of your other recipes. Thanks so much, Gabby! I agree, a mixture of fresh berries would be divine!